Among the properties of cilantro protrudes which is rich in oils that act on the digestive system, which stimulates appetite and relieves irritation. Coriander also has a lot of vitamins, particularly vitamins A and K but also contains enough vitamins B, C and E.
Another important property is cilantro mineral content, such as potassium, calcium, magnesium and phosphorus. Coriander has properties in components that aid in the detoxification of metals, as their chemical compounds to toxic metals helping eliminate stick body. An infusion of the fruits of coriander can help expel mucus from the respiratory tract, stimulate breast milk production, alleviate liver failure, cleanse the body of harmful substances such as metals, bacteria, LDL cholesterol, etc..
coriander has anti inflammatory properties so it is used in creams against pains in joints and rheumatism. 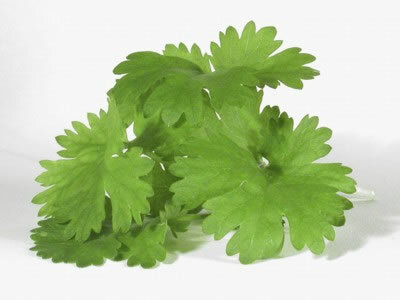 – In China coriander is used to treat stomach disorders, and the leaves are chewed to combat bad breath. These uses of cilantro make much sense, since a study at the University of Beira Interior in Portugal revealed that a solution of 1.6% or less of oil coriander (seeds) was sufficient to significantly reduce or eliminate bacteria such as E. coli, salmonella, bacillus cereus and some types of antibiotic-resistant staphylococci. This study showed the effect not only the use of coriander oil from its seeds, but also suggested as an explanation for acting on the bacteria. The results demonstrate that the use of coriander oil damages the membrane around the bacteria, which disrupts essential processes within bacteria, including breathing thereby causing death. – Researchers have suggested that the essential oil of coriander can play an important role in medical applications and in the food industry. This is especially true in developing countries where 30% of the population suffers from diseases related to food and water contaminated with bacteria. – It is estimated that cilantro can be very effective in clinical medicine in the form of lotions, creams, mouthwashes and even pills, to fight infections that misuse of antibiotics have become resistant to them and therefore not can be effectively treated. What did you think of this article? If you have not found it useful you can support us by sharing the link on facebook or any social network you use.